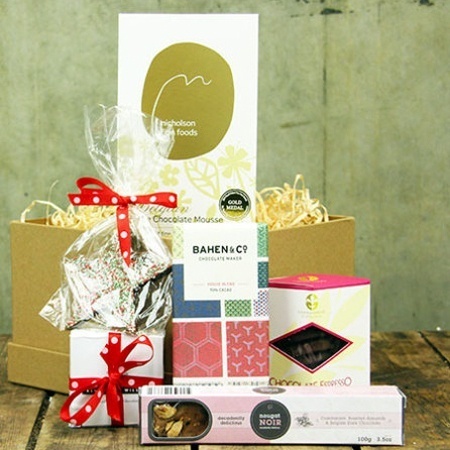 A Xmas hamper for lovers of chocolate. With an emphasis on quality, our Xmas hamper contains gourmet chocolate and sweet treats hand picked for their quality and deliciousness. Along with a `Make your own Belgian white chocolate mousse` kit (super easy to make, just add whipped cream! ), you will find Bahen & Co 70% cacao fair trade chocolate, ground from bean to bar on a family farm in Western Australia`s Margaret River. And a box of Conniseurs Collection chocolate espresso shortbread to enjoy with a cup of coffee. Cranberry, chocolate and hazelnut nougat to enjoy with a glass of red. 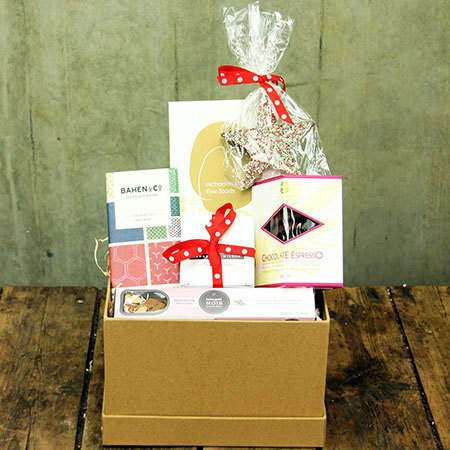 Plus a darling little gift box of four filled chocolates and chocolate star from boutique chocolate maker Kennedy & Wilson in the Yarra Valley. *PLEASE NOTE: Xmas hampers delivered Sydney only. Hampers available from 16th November 2015.